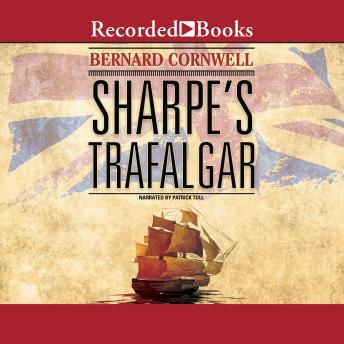 Bernard Cornwell's Sharpe series has consistently ridden the top of international best-seller lists since the first book appeared 18 years ago. Featured on American television by Masterpiece Theatre, the charming, valiant Richard Sharpe has amassed a huge fan club all his own. A guttersnipe who has risen through the ranks of the British army, Ensign Sharpe is sailing home to England from his latest campaign against Napoleon. Anticipating an uneventful voyage, the dashing young maverick discovers the intriguing and very married Lady Grace Hale on board the Calliope. But just as he wins his way into her heart, the ship is fired upon and, suddenly, he finds himself in the thick of one of history's most spectacular incidents: the Battle of Trafalgar. Patrick Tull's vibrant narration bedazzles listeners with this breathtaking retelling of one of Europe's most ferocious sea battles. i dont know anything about ships and i never grasped it. i did enjoy the story though i like him on ground better.